On May 6th, NOAA ESRL published the February, 2018 global average carbon dioxide concentration. The average of 408.39 was 2.78 ppm above February, 2017. This is an unusual jump because it seems to be the highest of any non-El Nino impacted year and tied for third highest of any February monthly increase. It will be interesting to see how this is revised when the March 2018 averages are released. This trend of increases is evident in the NOAA ESRL global CO2 concentration as measured since January, 1980. What is more concerning is that the five year rate of increase has moved up to 12.90 ppm compared to February 2013. The return to increasing five year change rates may indicate rising global CO2 emissions as much as the impact of northern hemisphere winter. 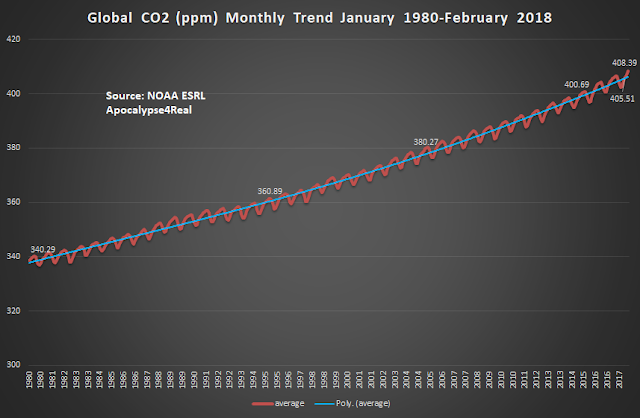 The February decadal change was 22.90 ppm above February 2008. This is the highest global CO2 10 year change of any month in the NOAA ESRL record. If the trend holds, we will move above a 23 ppm change rate sometime this summer. This is not the trend we want to see - or live with. These global CO2 increases become more stark when placed against earlier base concentration averages. Since 1980, with a base of 338.45 ppm, a 20.42 percent increase. Since 1958, with a base of 315.97 ppm a 29.25 percent increase. Since 1880, with a base of 290.8 ppm, a 40.44 percent increase. Since 1750, with a base of 278 ppm, a 46.90 percent increase. 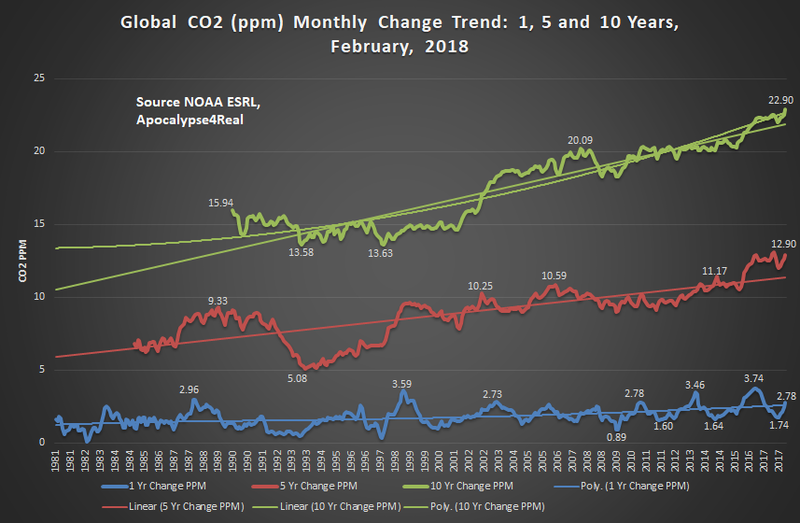 It is quite likely the global CO2 monthly average will move above 409 ppm, but less likely to reach a 410 ppm monthly average in May or June of 2018. 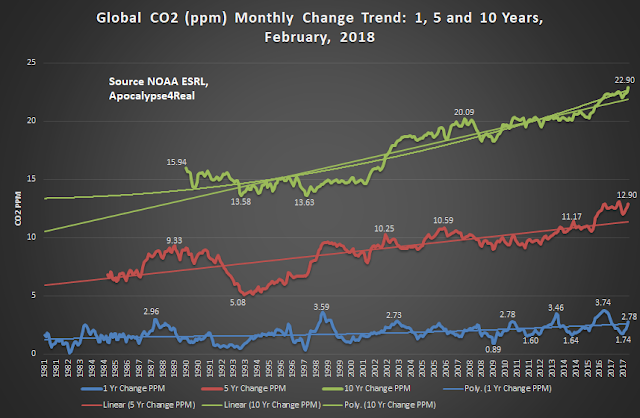 But a global monthly average above 410 ppm has high probability of occurring in 2019.